WWF’s Living Forests Report is part of an ongoing conversation with partners, policymakers, and businesses about how to protect, conserve, sustainably use, and govern the world’s forests in the 21st century. The series explains the reasons for, and implications of an ambitious forest conservation target: Zero Net Deforestation and Forest Degradation (ZNDD) by 2020. It is a target that reflects the scale and urgency with which threats to the world's forest and climate need to be tackled. 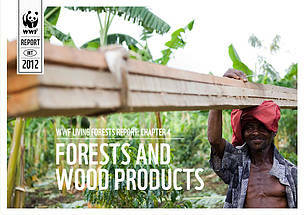 To understand what ZNDD would mean in practice, WWF developed the Living Forests Model with the International Institute for Applied Systems Analysis (IIASA), which forms the basis for the Living Forests Report. The model allows us to explore various global land-use scenarios. It calculates the effect of forces such as population growth and consumer demand, and describes possible consequences on key areas such as food production, climate change, biodiversity, commodity prices and economic development. The Living Forests Model finds that achieving ZNDD is both possible and urgent. But it will not be easy. "WWF's analysis of global deforestation trends highlights where we can expect to witness the loss of forests in the coming decades, and what will cause this. While this highlights big challenges, it also identifies a huge opportunity to help combat climate change through further domestic and global action on forests, particularly as part of a new climate regime to be agreed in Paris this year." "The WWF report shows us that actions by companies to eliminate deforestation from their supply chains is crucial in tackling forest loss and its impending consequences. Concerted action by companies across multiple commodities, along with improved governance and collaboration with NGOs, is crucial to achieve the goal of zero net deforestation by 2020, as outlined in the Consumer Goods Forum resolution." The latest chapter in the series, Saving Forests at Risk, identifies where most deforestation is likely between 2010 and 2030: these are the deforestation fronts where efforts to halt deforestation must be concentrated. The chapter also provides compelling examples of solutions for reversing the projected trends in these deforestation fronts. 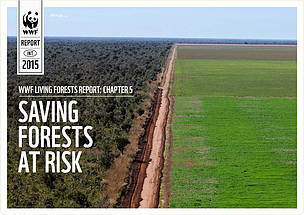 Cover of Living Forests Report, Chapter 5. Can we produce more wood without destroying or degrading forests, in a world where competition for land and water is increasing? Our research suggests it’s possible, and that it could even be good for the planet. But it’s a challenge that spans the whole supply chain. 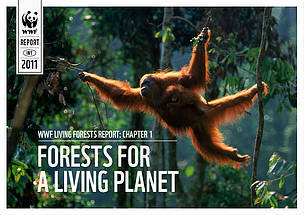 Cover of Living Forests Report, Chapter 4. Reducing forest loss helps people and ecosystems by cutting greenhouse gas emissions, sequestering carbon, preserving ecosystems services and maintaining intact, functioning forests that have the best chance of withstanding and adapting to climate change. 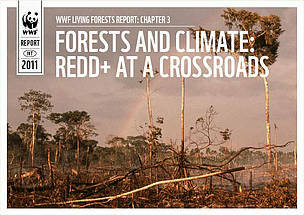 Cover of Living Forests Report, Chapter 3. As the world’s population grows and competition for land becomes more acute, can we produce more bioenergy and still achieve WWF’s goal of no overall loss of forest area or forest quality – Zero Net Deforestation and Forest Degradation (ZNDD)? In the immediate future, deforestation and forest degradation could be halted while meeting global demand for food, materials, and bioenergy. Beyond 2030, maintaining ZNDD will require higher productivity across large, often sub-optimal, areas of land. 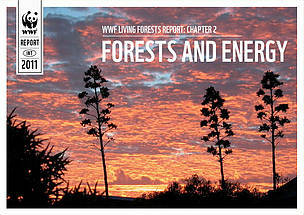 Cover of Living Forests Report, Chapter 1.